Archaeology and war don't usually mix, yet that's been the case for years at Karkemish, an ancient city along the Turkey-Syria border where an excavation team announced its newest finds Saturday just meters (yards) from Islamic State-controlled territory. 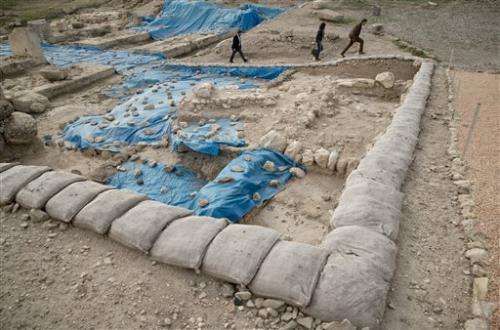 Karkemish, dating back more than 5,000 years, is close to the Syrian city of Jarablous, which now flies the black banner of the Islamic extremist group. U.S.-led coalition aircraft flew overhead as Nicolo Marchetti, a professor of archaeology and art history of the Ancient Near East at the University of Bologna. He is the project director at Karkemish, where the Turkish military let archaeologists resume work in 2011 for the first time since its troops occupied the site about 90 years ago. "Basically we work 20 meters away from the Islamic State-controlled areas," Marchetti said, standing at the site, which is guarded by more than 500 Turkish soldiers, tanks and artillery. "Still, we have had no problem at all. ... We work in a military area. It is very well protected." 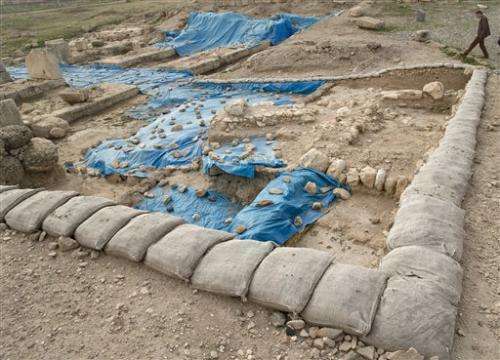 The project, which also includes archaeologists from Gaziantep and Istanbul universities, is doing the most extensive excavations at Karkemish in nearly a century, building on the work of British Museum teams that included T.E. Lawrence, the adventurer known as Lawrence of Arabia. Marchetti said the plan is to open the site to tourists next spring. A concrete barrier, about four meters high, will be installed at the site. "This will be a total protection for the tourists," he said. The strategic city, its importance long known to scholars because of references in ancient texts, was under the sway of Hittites and other imperial rulers and independent kings. However, archaeological investigation there was halted by World War I. It was stopped again by hostilities between Turkish nationalists and French colonizers from Syria who built machine gun nests in its defensive walls. Part of the area was mined in the 1950s, and in later years, creating deadly obstacles to excavation. Demining was completed just a few years ago. 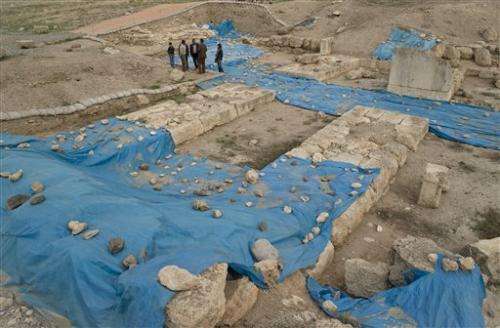 Archaeologists are completing their fourth season unearthing the secrets of Karkemish along the Euphrates. The name Karkemish means "Quay of (the god) Kamis," a deity at the time in northern Syria. Stone monuments decorated with sculptures, hieroglyphics and more than 20 meter-high city walls attest to the influence of the town. Among this year's finds were sculptures in the palace of King Katuwa, who ruled the area around 900 B.C. There were five large orthostats in limestone and basalt, a dark grey to black rock, that portray row of individuals bearing gifts of gazelle. An orthostate is an upright stone or slab that forms part of a structure. The archaeologists also found a mosaic floor in the palace of Sargon II, who reigned around 700 B.C. over Assyria, an ancient empire mostly located in Mesopotamia. And the team finished exploration of the ruins of the expedition house of Lawrence of Arabia, who worked at Karkemish between 1911 and 1914. The team began its project in 2011 around the time that the Syrian uprising against President Bashar Assad was escalating. About one-third of the 90-hectare (222-acre) archaeological site lies inside Syria and is therefore off-limits; construction and farming in Jarablous have encroached on what was the outer edge of the ancient city. Most discoveries have been made on the Turkish side. Interesting article but this would have been so much better with a few pictures of the finds described. Plus a lot of repetetive text accompanying the pictures, pictures who are themselves very similar to one another and does not show anythng of interest - one of them would have been plenty enough - really. 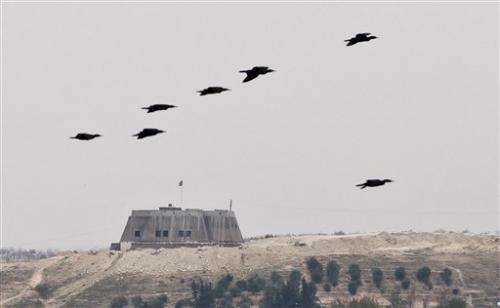 Why is that building in Syria in Jaroblous with that filthy black funeral shroud for ghouls ....still standing. US should take it out with a 20,000 pound bomb and follow it up with white phosphorous and napalm and cluster bombs.